With the majority of IR concentrators electing to study abroad, the IR concentration is the single largest group of students at Brown who broaden their world view through cultural immersion. Study abroad is the international educational experience par excellence—students learn to view the world and others more objectively while learning to communicate and work in another language side by side with local university students. Study abroad programs often work best when undertaken for an entire year, since in many countries courses run on a year-long basis. Many students, however, choose to study abroad for one semester or over the summer. The study abroad experience often translates into a more internationalized academic program upon return to Brown, as students pursue newly discovered interests. In numerous cases, intellectual curiosities derived while abroad become springboards for independent study projects or honors thesis research. Will my courses count for IR? How to get IR credit for study abroad coursework. Two courses per semester — for a total of four if abroad for one year — may be applied toward IR. IR credit is dependent upon course content and level. 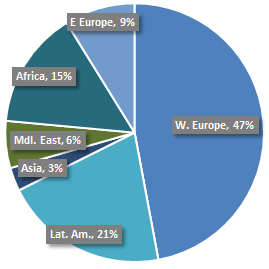 Most students use study abroad to fulfill the Regional requirement. Only IR concentrators (i.e., those who have filed IR) may receive preliminary approval required by the OIP (study abroad office). Meet with the concentration advisor to review the completed OIP pre-approval course form* OR bring the OIP pre-approval course form* at the same time they officially file the concentration for IR. *The pre-approval course form is part of the online OIP application. It is the student's responsibility to fill out the form, print it, and meet with their concentration advisor to find out what the department's rules are for transfer credit for study abroad, since each department has its own requirements. Email IR Concentration Advisor if course plan changes. Attach syllabus and/or course description for approval. Complete IR Study Abroad Concentration Credit Approval form. Meet with IR Concentration Advisor for final approval. Study abroad is recommended during the junior year for several reasons. First, prior to the junior year, students are often unprepared for the course work, which generally begins at a higher level outside the United States. Second, except for students who come to Brown with strong preparation in a foreign language, at least two years—and in some cases three years—of university study of a language are required to cope in a university where the language of instruction is not English. Third, most students prefer to spend their senior year at Brown to finish concentration requirements, to take advantage of senior seminars, and to enjoy the social experience of spending their last year in college with their friends and graduating class. While the IR Program strongly recommends study abroad, it is not formally required. Exceptions to the general desirability of study abroad may apply to international students for whom study in the United States is itself study abroad, or for American students who have lived or studied abroad extensively before coming to Brown. Even in such cases, study abroad may still be extremely useful, especially in parts of the world which are different from those in which the student has lived previously. Finally, students should be aware that studying abroad for an entire year puts them at some disadvantage in preparing for a senior thesis: students who are away know fewer Brown faculty members who may serve as advisors, and connecting with faculty who don’t know you for feedback on the prospectus can be challenging.